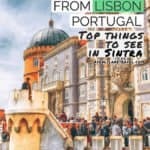 When searching for the best things to do in Portugal, you have to consider visiting Sintra! Sintra Portugal is the kind of place where a magical atmosphere hits you smack dab in the face. With stunning mountains, lush forests, and ancient landmarks at every turn, this UNESCO World Heritage Site is literally like a fairy-tale. When you travel further away from the Atlantic and deeper into the surrounding hills, this is also quite a remote experience in a much quieter and stunning pocket of Portugal. While iconic palaces and extravagant mansions shimmer in the sun, a majestic castle sits at the centre of this intriguing town filled with heritage. The Celts worshiped the moon gods here and the Moors built the castle, while royalty roamed the exotic gardens with endless lichen, ferns and colorful flowers. 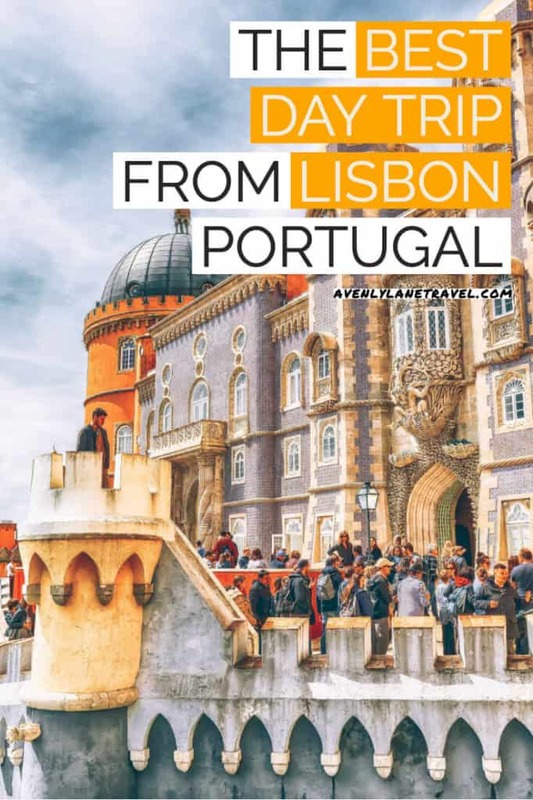 At the same time, this is not just a historical or cultural destination but also a popular tourist town and the range of things to do make this one of the most popular day trips from Lisbon. It’s true, whether you spend this time walking the streets, exploring the castle or marveling at opulent mansions, the attractions are fascinating and the food and local hospitality are also second to none. 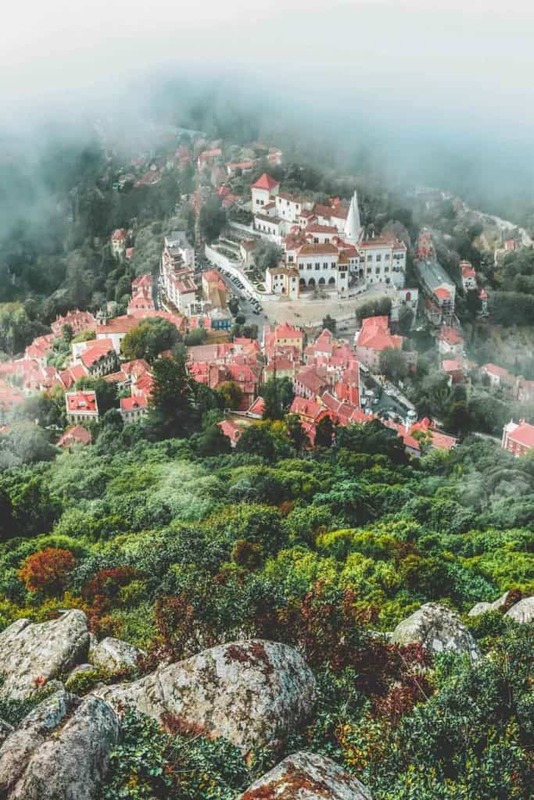 Located in the midst of the Serra di Sintra hills, Sintra is situated in quite a remote part of the countryside in spite of being just 28km from the city centre in Lisbon. You can take either the public bus or train to Sintra but waiting around and lining up can prove frustrating and this is certainly true at Rossio Station. On the other hand, driving to Sintra in a rental car is an option but crowded roads, frantic drivers and lack of parking are just as frustrating. 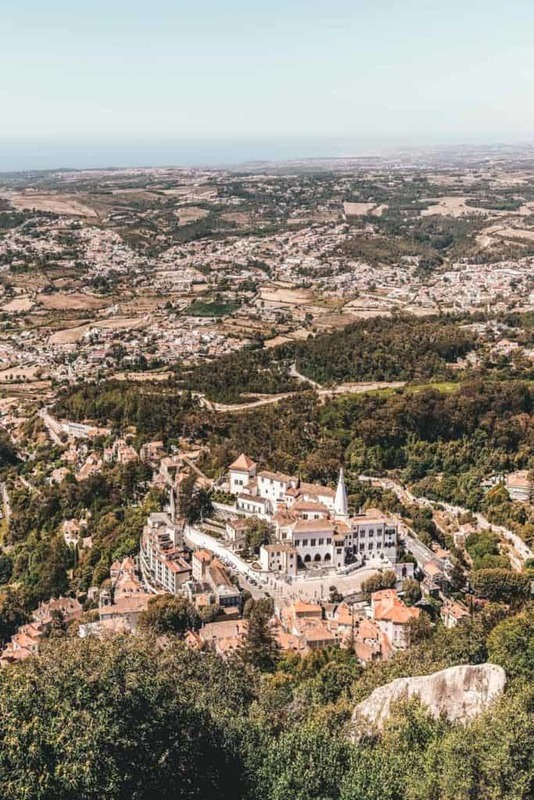 For this reason, most visitors take organised day trips from Lisbon to Sintra as this pre-booked tour can avoid these hassles and allow guests to focus on the attractions. Built in the 8th century by the Moors, this ruinous castle is a National Monument and one of the most iconic landmarks on the Sintra landscape. 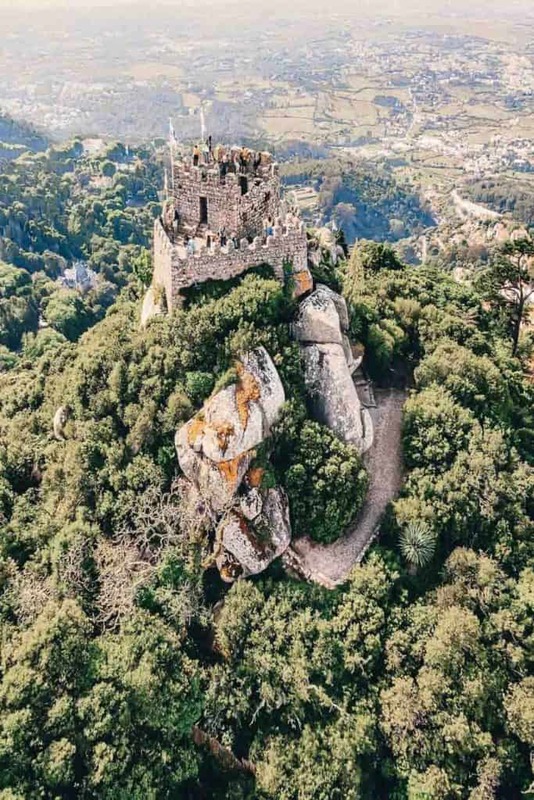 Situated amidst the trees and scrub of the Serra de Sintra hills, the castle was initially built as a lookout tower but fell into disrepair after Christian forces conquered Portugal in 1147. However, the Castle of the Moors was restored by King Ferdinand in the 9th century and re-constructed to create this extremely romantic ruin. Featuring spectacular view across Sintra, the castle is now one of the most popular attractions for day trips from Lisbon and the crumbling battlements look especially impressive as you stand up on the stone parapet. In this sense, the ancient stone walls around the castle offer a truly magical sight as they weave and wind with the contours of the hills. Sintra Palace is the most impressive medieval royal residence in the country and the only remaining palace from the Middle Ages. Located at the heart of the old town centre, the palace was also built by the moors and is distinguished by unique and colourful architecture. What’s more, Portuguese royalty and rulers lived in the palace between the 15th and 19th century making it the headquarters and most important focal point of Sintra. It’s no wonder people want to come here on day trips from Lisbon! Although the Christians made some changes in the years that followed, Sintra Palace is literally untouched since the 16th century and still retains all the same features and characteristics that made it so famous. As you might expect, many Kings have inhabited the palace and only minor renovations were carried out since then. Surrounded by hunting grounds and courtyards, Sintra Palace is now one of the most interesting things to see on day trips from Lisbon. While every part of this stunning palace is worth exploring, the old chapel, small garden and old palatial rooms are often the highlight for visitors wanting a glimpse into the life of medieval royalty. Featuring unobstructed views of the town and surrounding hills, Pena Palace is like a magical kingdom where luscious gardens open up to the most incredible façade in Sintra. In other words, the exterior of the palace is an awe-inspiring sight that features a mash-up of Gothic, Moorish, Medieval and even Renaissance architecture. As if that’s not enough, the bright colour palette of red and yellow make the palace pop amidst more than five hundred acres of green flora and exotic trees. Meanwhile, the elegant interior is just as fascinating with antiquated furniture, intricate stonework and bright colours at every turn. What’s more, each sculpture, painting and element of the design seems to be a quiet nod to culture, arts and science from various times throughout history. 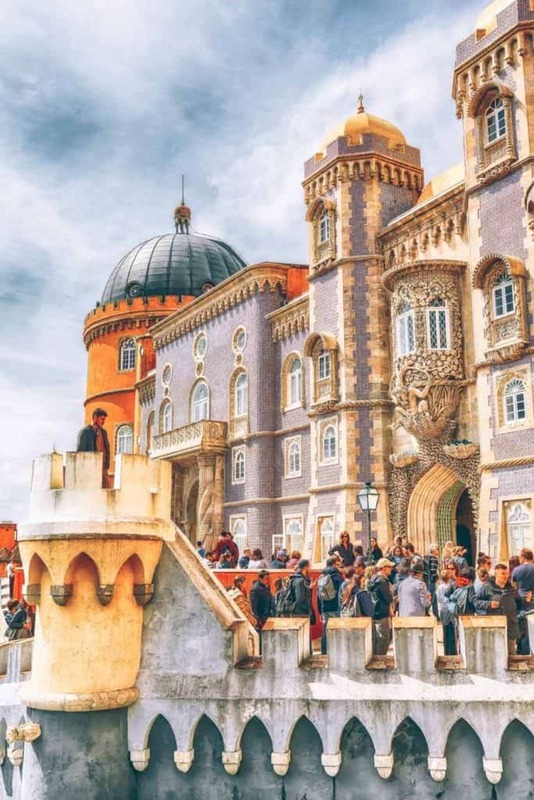 In fact, if you wanted a glimpse into what a life of excess might look like many centuries ago, Pena Palace is probably the best place to imagine one. At the same time, the winding paths and lush gardens add even more colour to the occasion, while the centre of the palace features a courtyard with some interesting azulejo – the famous ceramic tile art. 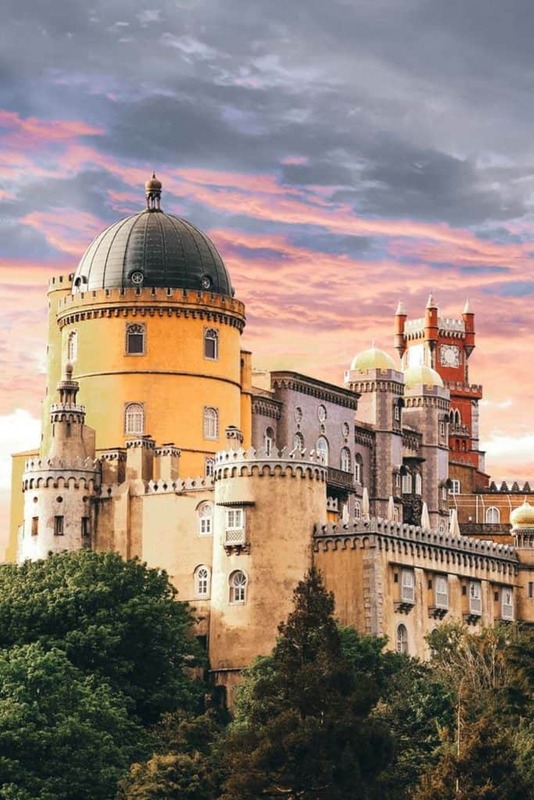 As with the Castle of the Moors, King Ferdinand decided to re-build Pena Palace in the 18th century with both he monastery and clock tower receiving a complete makeover. Opening Times: You can take day trips from Lisbon all-year except between Dec 25th and Jan 1st. Quinta da Regaleira initially belonged to wealthy merchants from Porto before another famous merchant, Antonio Monteiro, decided to purchase and build a home on the property. Monteiro was quite an eccentric character and hired a French artist to design his mansion and gardens according to his rather mystical and personal beliefs. For this reason, you can find symbolism in every sculpture, sturture and design with each one related to ideologies such as alchemy, freemasonry, Christianity and the Knights Templar. Outside and underneath the actual home, stunning gardens are interrupted by ancient towers, hidden tunnels and passageways which were created to mimic certain initiation ceremonies and secret orders. 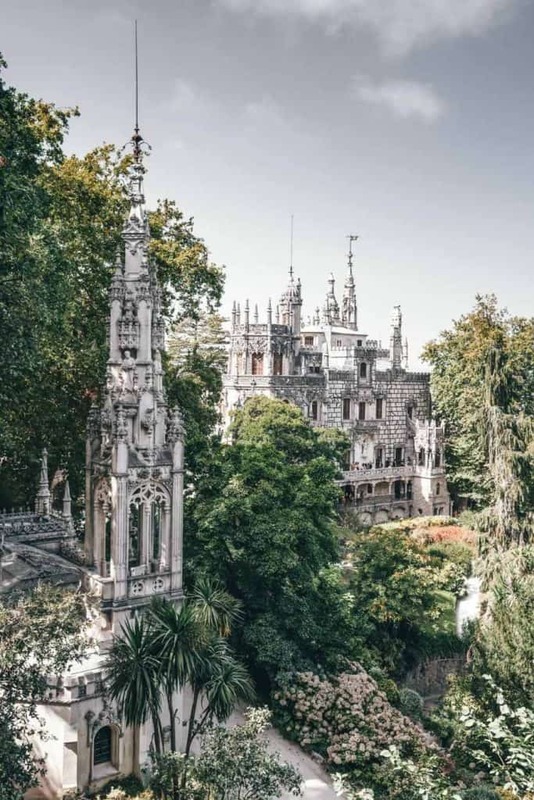 With this in mind, Quinta de Regaleira is best known for these surroundings which never fails to amaze and delight the visitors who get lost amidst the sculptures. You will even find a lake and ten-story well inside these grounds, while the darkness of the underground only serves to emphasize the colours on the surface. 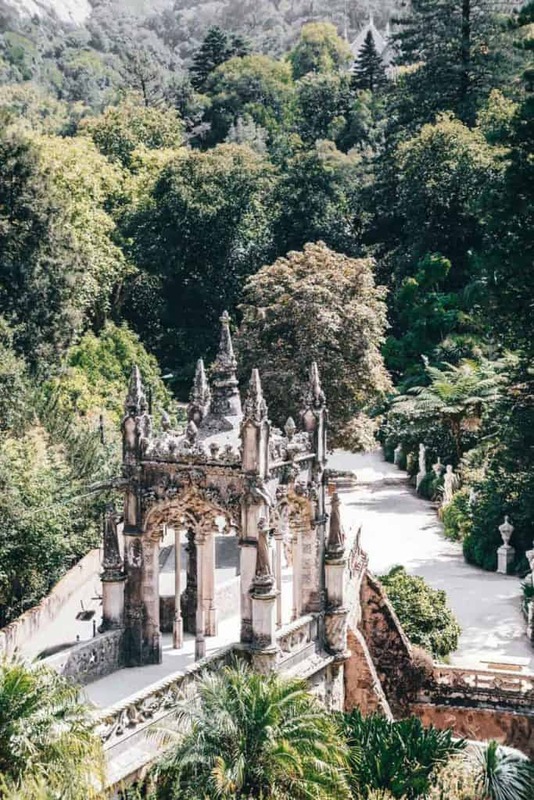 It’s true, many visitors come to Sintra to see either the palaces or the castle, but then leave with the enchanting runnels and gardens of Quinta de Regaleira on their mind. Would you take a day trip from Lisbon to Sintra to see these beautiful sites? 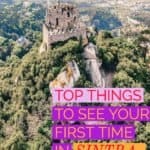 When it comes to day trips from Lisbon, there is simply nowhere more exciting or interesting than the town of Sintra. With luscious hills and greenery in every direction, this can truly feel like an escape and even medieval royalty decided on Sintra for some peace and quiet. Either way, the stunning scenery, historical remnants and majestic structures provide an unforgettable encounter in town that feels every bit like a fairy-tale.